Operating the DoubleTap is a breeze. The ten pound double action trigger pull is butter-smooth thanks to precision ball bearings and then breaks crisply. Each successive pull of the trigger drops the snag-free internal hammer on each chamber in an alternating fashion, giving the shooter maximum opportunity to make sure they get a round off. If a round fails to go off, the next pull of the trigger will try the other round and the next trigger pull will give you another try at the first round. Manipulating the ambidextrous thumb latch opens the DoubleTap’s barrels, automatically ejecting spent shells and leaving your ready to load the next two rounds from the storage compartment inside the grip. There are several options available for shooters concerned about the (presumably significant) felt recoil from a .45ACP defensive load out of a 12 ounce pistol with a three inch barrel. 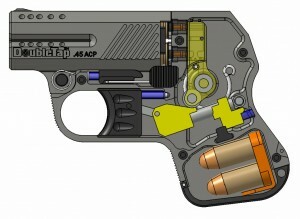 The first option is to simply opt for the 9mm version. This may not be an option, however, for those who demand the power of a 45. Heizer also offers progressive barrel porting for an additional $60 on top of the $499 price tag of the aluminum model or $729 price of the titanium model. The DoubleTap also features interchangeable barrels so you can have the flexibility of 9mm or .45ACP on the same frame with extra barrel assemblies starting under $250. 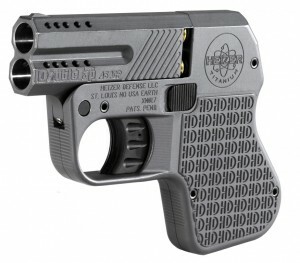 To learn more about Heizer Defense and the DoubleTap, visit their website at heizerdefense.com.